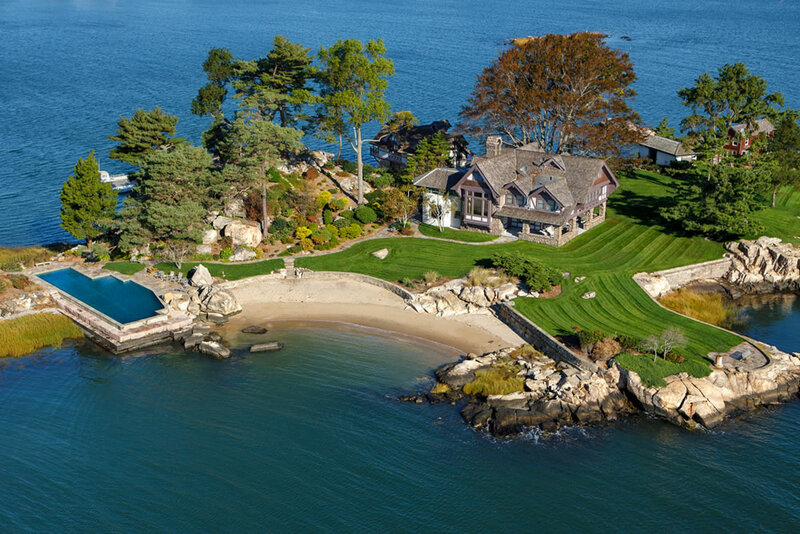 For those looking for a showstopper, Tavern Island offers a private island retreat that is rich in history as well as its share of celebrity. Inhabitants of the island date back to 1651 with the arrival of European settlers. The 3 ½-acre island later weathered the British invasion of Norwalk, CT, during the Revolutionary War. In later years, its positioning served as a key point for harbor pilots to guide vessels to land, and once safely arrived, they would invite captains and crew to imbibe in celebratory spirits, hence the re-christening as Tavern Island. The Tudor style main house dates back to 1900 and features native stone and other construction materials that were brought to the property by oxcart over frozen waters. Totaling more than 6,100 square feet, the stunning home, surrounding grounds and island infrastructure have been meticulously maintained by its current owners. The main floor features coffered ceilings in the living room, stone fire place and an updated kitchen with top-of-the-line appliances. The second floor showcases luxurious sleeping quarters: two bedrooms with en-suites and a master bedroom with a large dressing area and two offices, exercise room, changing rooms and steam room—all with direct outdoor access so family and friends can enjoy the pool and beach without tracking sand or dirt through the main house. The third floor showcases an additional three bedrooms and bathroom. Over the years, the spacious home has hosted luminaries of stage and screen, many of which visited by invitation from theatrical impresario Billy Rose. Throughout the 1920s and 30s, Rose wrote lyrics for songs that have become ingrained in the American Songbook, including “ Me and My Shadow” and “It’s Only a Paper Moon.” Rose’s parties attracted Hollywood and New York elite in the 1950s and 60s, including the likes of Marilyn Monroe and Maureen O’Sullivan. But Tavern Island’s colorful past boasts more than free-flowing champagne and visits from high society. Writer Lillian Hellman is rumored to have rented the caretaker’s cottage, which originally served as lodging for the harbor pilot. The two bedroom, two-bathroom cottage imbues creativity, for it is at this locale that Hellman is said to have completed The Little Foxes in the late 1930s. For years, Tavern Island was also home to the Falconer family, where author, illustrator and set designer Ian Falconer grew up, traveling by boat to school. One can imagine how his adventurous island childhood may have impacted the creation of his famed illustrated character Olivia, from the children’s book series. The current owners of Tavern Island have resided year-round on the property for more than 30 years and have preserved the island’s integrity through structural upgrades and meticulous care. Mainland city water and electricity as well as an on-site generator and 8,000 – gallon fuel oil tank service the island. In addition to the main house and caretaker’s cottage, the island’s new owners will also discover a boathouse and teahouse on the grounds. The boathouse was rebuilt in the 1990s and features a workshop with workbench and saws, while the upstairs includes a bedroom and bathroom as well as game room with a ping-pong table for the occasional rainy day activity. With eastern views of the Norwalk Islands of the National Wildlife Refuge and only an hour from midtown Manhattan, Tavern Island at its best is for the adventurer who still wants to maintain easy access to everyday conveniences. Island life can include windsurfing, kayaking, waterskiing or a dip in the Olympic-length pool that overlooks one of four private beaches. On the mainland, a half-acre property is deeded that includes a large dock for year round access, a small garage/cottage, two enclosed heated launches and parking for over a dozen vehicles. Tavern Island awaits its next great chapter. And if history is any indication, it will be one worthy of a standing ovation.